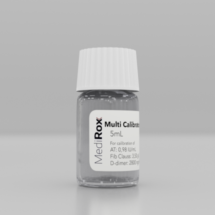 Medirox D-Dimer series is developed for unified D-dimer reporting across multiple systems. Each reagent in the series utilizes the same monoclonal antibody, but is suitable for different systems, ensuring a coverage of most measuring systems. The reagent series is composed of three different assays, MRX143 made to work on measuring systems using red light, and two different reagents MRX147 and MRX 147B for blue light. MRX147 is designed to work on semi- and fully automated instruments with short beam paths, whereas MRX147B is designed to work on the classic instruments having a wider beam path. D-dimer is a key indicator of thrombotic events such as deep venous thrombosis (DVT), pulmonary embolism (PE) and disseminated intravascular coagulation (DIC). MRX D-Dimer is used to exclude a diagnosis of DVT or PE and to monitor therapy in DIC. The reaction is obtained through latex particles coated with a monoclonal antibody directed against D-dimer. In the presence of D-dimer the latex particles will aggregate and an optical change can be measured. An obstacle in standardising D-dimer reporting has been that manufacturers of instrument have developed reagents based on a unique series of monoclonal antibodies. This has led to a variation in results between systems, and besides the risk of confusion regarding patient results it complicates all forms of external control programs. MediRox series of D-Dimer is unique to share one monoclonal antibody for all reagents. 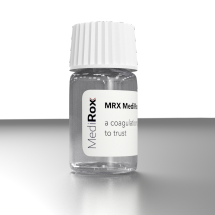 With the same antibody MRX143 and MRX147/147B can be used on most reading devices, and can be jointly calibrated. D-Dimer Calibrator for calibration of MRX D-Dimer assays (MRX147B/MRX147/MRX143), suitable for instrument readers with wavelengths of 400-600 nm or 600-800 nm.